With a history that started around 40 years back, Volkswagen Passat today stands with an almost stable identity in front of its customers. 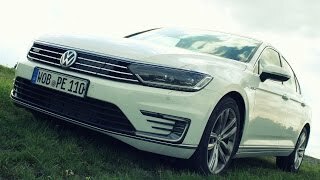 With its powertrain resembling to Golf GTS, eighth generation Volkswagen Passat GTE 2015 very well managed to increase the final output and gained commendable attention with its release at 2014 Paris Motor Show. Let us have a detailed look at the model. Interior of Volkswagen Passat GTE 2015 though holds its roots majorly in the regular model but there are certain changes to differ this Volkswagen Passat GTE Hybrid from the regular ones. Changes in major get the highlights of blue like, blue ambient lighting in the cabin; “Sevilla” wrapped seats with blue seating surface and the door panels with a highlighted blue stripe. Not only these steering wheel and gear shift knob too get red stitching while though mentioned last but one with high attracting intensity, changes in infotainment system and instrument cluster’s functions and display commendably narrate the glory of Volkswagen Passat GTE 2015 being a Hybrid model. 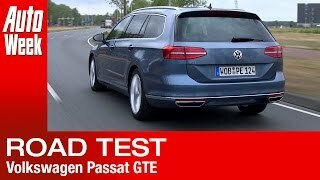 Exterior of Volkswagen Passat GTE 2015 we noticed has been uniquely styled when compared to its ‘regular’ siblings. Major changes that came in front of us were the one incorporated through an all new bumper that now comes with trapezoidal air inlets, though shorter but accompanied by an additional dam on each side. Each of these dams incorporates daytime also features running lights. Accompanying in front fascia is the chrome grille and again the accents of blue lining from the grille till the headlamps. To narrate the saga of Volkswagen Passat GTE 2015 being a hybrid model accents of blue also follows till the blue brake calipers sneaking through 17” alloy wheels. 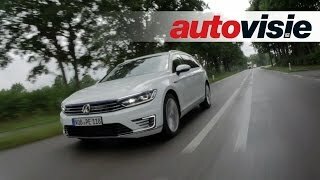 Volkswagen Passat GTE 2015 gets its power through a 1.4 Liter four-cylinder engine that delivers 154 HP and equipped also is an electric motor that send additional 114 HP to the front wheels. Like this the total output comes to standstill at 215 HP and 400 nm torque paired to Six-Speed DSG transmission. 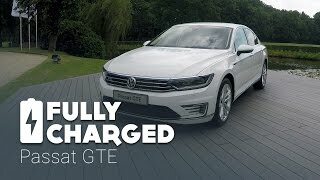 With its power specifications Volkswagen Passat GTE is capable of reaching 0-62 mph in 8 seconds while the top speed touched 136 mph. Apart from these Passat GTE 2015 comes with four driving modes namely, E-Mode, Hybrid, Battery Charge and GTE.